Will your cargo arrive ‘dry’? One of the most common claims against bulk carriers is damage to cargo from water ingress and more seriously, where this happens in cargoes vulnerable to liquefaction, it can result in the capsize and loss of the vessel and often loss of life. and or side tanks, cofferdams etc. susceptible to leaking in general as a result of corrosion, bad joints and physical damage from cargo handling gear. The costs involved can be high especially where a fuel line has leaked and oil pollution is involved in the clean up and disposal costs on top of cargo losses and delays. hide them and also allows the hidden build up of cargo residues which retain moisture and enhance corrosion or the residues may in themselves be corrosive, sulphur for example. Accidental physical damage can occur during cargo operations and the damage is not immediately apparent as the line may not be full at the time. Poor maintenance of protection plates and grills can increase this risk. Blocked and leaking bilges can cause small problems but also major issues, including hold flooding. The main causation is poor maintenance, and a lack of routine checks and testing. Bilges become blocked up due to cargo residues of previous and/or current cargo entering into the bilge well and blocking the strum box/suction. Generally, due to the perforated well cover plate not having a suitable filter cloth over it (e.g. hessian), if the bilges are blocked then any water that enters the hold cannot be pumped out. If the strum box is loose or worse in a corroded condition or missing then particulate matter can enter the bilge system causing non-return valves to stick open. When this occurs and the bilge line is being used, water will enter the bilge and then the cargo hold. Prior to loading a cargo the bilges should be thoroughly cleaned and suctions, non-return valves tested to ensure water can be pumped out and cannot flow back in from the suction line. Cargo hold ventilators come in different forms; natural flow and force draught; mushroom with lever flap (pictured); with screw- down flap; hatch coaming/lid door louvre style vents/cowl vents etc. The flap mushroom vent is quite high above the deck to allow for deck cargo, but it reduces its susceptibility to water ingress in rough weather/shipping seas. However, the closing flaps and seals are difficult to maintain and liable to leak. Often the rubber seals are found to be ‘dead’, i.e. are hardened and without any elasticity for compression and, in some cases, perishing. In addition these vents are prone to corrosion from the inside out and physical damage from cargo handling. The small screw-down vent seen is a more sturdy design but similarly liable to damage. The example seen above has been damaged due to the crew running a mooring line adjacent to it that became taut under the hood when being heaved up. It is impossible to close this vent as is. Cowl vents require canvas covers to be lashed over them. Other vents be they on the hatches, coamings or separate trunkings normally have doors/lids that are screwed down on a rubber gasket with butterfly clamps. These are dependent on no corrosion or distortion and a good seal in place. Ventilator water tight security is dependent upon their being closed in wet conditions. tightened, the gasket is pliable and undamaged and the cover plate is in good order and in place. Leakages from tanks, fuel and ballast water can be problematic at the best of times but if cargo is in the hold then the result can be very expensive. Cargo hatches of all types are susceptible to leakage and this is for several reasons all of which can be resolved through regular checking of the hatches and hatch coamings, clamping, securing devices and drainage systems. Ultrasonic testing is probably the best and most efficient way of testing the weather tightness of ships hatches and associated openings. Loss of watertight integrity of the cargo hold can result in heavy claims for damaged cargoes, not least the value of the cargo but the cost of subsequent delays for removal, disposal and replacement as well as claims from receivers from loss of production etc., especially considering today’s tight schedules for supply chains. Ultimately though it can result in the loss of the vessel. Not only should the drain channels around the coaming be intact and clear, the non-return valves at each corner should be cleaned and examined every time before a hatch is closed to ensure they are operational and that the end cap is not screwed on. These valves consist of a chamber with a ball float within that will allow water to drain out but not flow in. Other leakage problems are caused by poorly maintained hatch open/close equipment increasing damages to the hatch lids. Steelwork issues are also problematic: these include corrosion through the hatch lid (see picture left) cross joint seal, long-term poor maintenance. In many cases there is nothing wrong with a hatch lid but crews do not always follow the manufacturers guidance on closing and securing a hatch. This results in unbalanced compression on the seal from clamping one area too tightly which can prevent the opposite area from being clamped down and forming a seal. 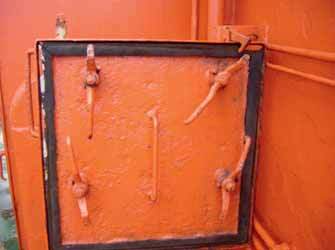 This is often not apparent, ships staff should be trained in the correct procedures for opening and closing the numerous types of ship hatches and how to achieve a tight seal. Training should also be given on the continual maintenance of hatches vents and accesses and their associated equipment. Regular observation of and testing of hatches by water pressure/ultrasonics at regular intervals or after structural accidents should be a standard procedure. Braemar (Incorporating the Salvage Association), has offices worldwide offering highly qualified, experienced and trained surveyors who can provide the expertise to assist owners, charterers and insurers to survey vessels in regard to the above issues for loss prevention, post incident assistance and more in marine survey and technical matters. It can also provide ultrasonic testing if required using its modern equipment.